Let’s face it, anyone who tells you that learning French is an essential part of the changing global landscape is either French himself, or trying to sell you something. That doesn’t mean that speaking “la langue française” isn’t cool, cultured and a hell of a party trick however. 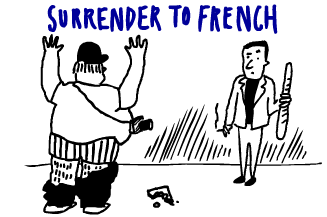 With French in your arsenal, you’ll certainly turn some heads at the discotheque, the bistro, the bedroom, and especially the bidet. What is the real draw of this language though? How will it make you a more sophisticated and thus a better person – more suave, more cultivated, with lower hygienic standards? That’s the question that we’ll attempt to answer with something exceedingly rare on the Internet these days, a top 10 list. Stay tuned next week for reason #1 to learn French: Dominate your dinner menu.